We’d love your help. Let us know what’s wrong with this preview of Season of Salt and Honey by Hannah Tunnicliffe. A NOVEL OF LOVE, GRIEF AND ANTIPASTI. Francesca 'Frankie' Caputo has it all figured out. She's finally going to marry the man she loves and then they will live happily ever after. But when a freak accident cuts her fiancé Alex's life tragically short, all of Frankie's future plans suddenly disintegrate. Drowning in grief, Frankie flees from her overbearing Italian-American f A NOVEL OF LOVE, GRIEF AND ANTIPASTI. Drowning in grief, Frankie flees from her overbearing Italian-American family, and escapes to an abandoned cabin owned by Alex's parents in a remote part of Washington forest. As her heart slowly begins to heal, Frankie discovers a freedom that's both exhilarating and unsettling to everything she has always known for sure. So when her old life comes crashing back in, Frankie must decide: will she slip quietly back into her safe, former existence? Or will a stronger, wiser Frankie Caputo stand up and claim her new life? To ask other readers questions about Season of Salt and Honey, please sign up. This book starts at a funeral with Francesca (mostly known as Frankie) struggling to deal with the death of her fiancé Alex and the, at times, overpowering ministrations of her Italian-American family. She flees to an abandoned cabin owned by Alex’s family. There she meets the bubbly Merriem, Jack the cottage caretaker and his charming, effervescent daughter Huia. But it is not quite freedom in the cottage for her sister Bella with whom she shares a relationship fraught with anger and resentment This book starts at a funeral with Francesca (mostly known as Frankie) struggling to deal with the death of her fiancé Alex and the, at times, overpowering ministrations of her Italian-American family. She flees to an abandoned cabin owned by Alex’s family. There she meets the bubbly Merriem, Jack the cottage caretaker and his charming, effervescent daughter Huia. But it is not quite freedom in the cottage for her sister Bella with whom she shares a relationship fraught with anger and resentment, turns up along with several other people at times, some family, some not. I really liked Frankie. Her grief came across as real and I loved Merriem, Jack and Huai. I got the feeling there were something off about Alex but it wasn’t quite what I initially thought. The novel flashes back to the relationship between Frankie and Alex which started when they were teenage sweethearts at school. I have to say I wasn’t sure what she saw in Alex. That aside, I enjoyed this book and the way over time Frankie’s attitudes and responses to certain people and events changes. This is an enjoyable read that I read quickly as it kept me interested throughout. If you are into Italian food several recipes are included as an added bonus. 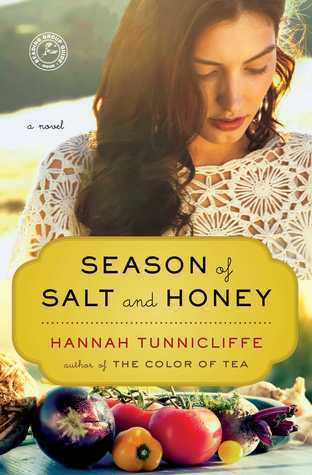 Season of Salt and Honey is a bittersweet story of grief, love, family and food from forkandfiction.com blogger and author, Hannah Tunnicliffe. Overwhelmed by grief after the death of her fiance, Francesca Caputo flees the sympathies of her well meaning family, seeking refuge in an abandoned cabin owned by Alex's parents in a forested area of Washington. All Frankie wants is time alone to mourn the loss of forever, but her solitude is repeatedly interrupted, forcing her to reassess everything she thought she knew about her relationship, her family and herself. "We were high-school sweethearts, just like everyone dreams about but no one actually has, because that kind of thing only happens in the movies. I knew right in my bones just how lucky I was. I knew everything was perfect, and did all the right things to keep it that way. Until now." Frankie's grief at the loss of Alex is raw and biting, I felt for her and could understand her wish to be alone. She is craving peace and quiet, and the time to wallow in her happiest memories, but eventually Frankie is forced to confront some painful truths about her relationship with Alex when an offhand comment shakes her to the core. "A loss that had started long before the ocean took him for good." Despite her desire for solitude, Frankie is befriended by caretaker, Jack, and his impish daughter, Huia, as well as the generous spirited Merriem, who all provide unexpected comfort as Frankie struggles to comes to terms with the changes Alex's death has wrought. I liked these charming, enigmatic characters who offer kindness without expectation. Frankie's family is delightful, stereotypically Italian there is no escaping their loving, if somewhat suffocating, concern. While her Papa is a solid, comforting presence, Frankie's aunts, Zia Rosa and Zia Connie, fuss and worry, cousin Vinnie makes mischief, and her estranged sister, Isabella, camps on her doorstep, reminding her of things she would rather forget. Frankie's family equates food with love, and Season of Salt and Honey includes the recipes for a handful of Italian dishes served and shared within its pages, including Pitta Mpigliata (Sweetbread rosettes with fruit and nuts); Lingua de Suocera (Marmalade filled pastries); Spring Risotto; and Pasta alla Norma (Pasta with eggplant, tomato and salted ricotta). "The smells of the forest — the damp dark of the soil, the bleeding sap of the trees, the lemony cedar smell — all vanish in the company of the Sicilian food: the pungent garlic in Zio Mario’s salami, the vinegar pickling the vegetables, olives bobbing in brine, roasted peppers, the ubiquitous, sunshine-coloured olive oil." When Frankie's fiancee Alex dies in a tragic accident, she is overcome with grief and can not bear a return to the apartment they shared, or to the coddling of her close Italian family. Instead, she flees to a tiny cabin owned by Alex's parents in a remote part of a forest. She has no idea how long she intends to stay, but just wants to be alone. Her family though have other ideas, and soon they begin to pitch up to check on her, including estranged sister Bella, the family mischief maker. As Fr When Frankie's fiancee Alex dies in a tragic accident, she is overcome with grief and can not bear a return to the apartment they shared, or to the coddling of her close Italian family. Instead, she flees to a tiny cabin owned by Alex's parents in a remote part of a forest. She has no idea how long she intends to stay, but just wants to be alone. Her family though have other ideas, and soon they begin to pitch up to check on her, including estranged sister Bella, the family mischief maker. As Frankie wrestles with her emotions and revelations concerning her relationship with Alex, she has to decide if a return to her old life is possible, or a new one is waiting in her future. The title of the book initially drew me in, it sounded so evocative. And indeed, the title completely matches the theme of the book, sad and sweet. With such brilliant writing, I couldn't help but feel moved over Frankie's situation. Her grief is deeply emotional, but not overwhelming to read about as we are treated to characters from Frankie's wonderful Italian family alongside her unravelling story. They are a riot, Aunties, Cousins, and her lovable Papa, who always descend with plenty of Italian delicacies, described in mouthwatering detail. Neighbours from her forest hideaway are a great addition. I wanted to run barefoot with Huia and pick mushrooms and garden with Merriem, I think you'll want to as well after reading this. A very beautiful and emotive story I highly recommend. The recipes were fun and I'd like to try them sometime. I couldn't seem to get into the rest of it, though. Would probably be a good beach read if I had the day to myself. Season of Salt & Honey is the journey of Francesca (Frankie) Caputo through life, love and loss. After the death of her fiancé, Frankie needs time and space to work through feelings – both hidden in the farthest reaches of her mind and the ones on the surface bubbling over in every breath she makes. She takes refuge in her finance’s timeworn forest cabin in the soothing Washington forest to sort herself out. Her path to recovery is filled with quirky neighbors, comfort food, and a painful self-awareness that is going to take twists and turns you won’t see coming. Kleenex is recommended. Season of Salt & Honey is an easy read. It is also one of those stories that stays on your mind a while after you finish reading it. I experienced a strange duel sense of melancholy and joyfulness at the same time after finishing this book. The author gives us a glimpse of what personal salvation looks like, but she does not finish the story line. I wonder if this is a two-parter? I, for one, would welcome that. Caution: Before reading this book, identify a local Italian deli to run to. You’ll need to pick up a few items for your kitchen pantry as you will definitely crave warm, soothing Italian comfort food and an espresso or two as you read through the book. Peruse the recipes before you read the book. Your time away from the book, can be well spent in the kitchen. Or, if you have a book club, assign each member a recipe and share as you discuss. There are also discussion questions and an author interview in the back to guide your book club time. This book was reviewed by both myself and Adrianne Morrison. Sometimes I enjoy the give and take of friends reviewing books from different perspectives. The review above was a summary of our two interpretations. I took the hard cover version, Adrianne took the kindle format. Both were easy to work through, meaning not all cookbooks translate into a good read on Kindle, but this one was fine. We both felt that the book should have had photos of the recipes. We also thought it would make a good gift or book club selection. I found this book to be sweet and charming. I was breezing through this book with quick speed. Frankie is a nice woman. Although even with all of the back and forth flashbacks to the past with her and Alex, I never really felt the love between them. In fact, I grew tried after a while of the flash backs with them together. The only good thing was that I good to see who Frankie was as a person and how she had matured in the present. Frankie's sister, Bella was cool. I liked Alex's brother, David. I found this book to be sweet and charming. I was breezing through this book with quick speed. Frankie is a nice woman. Although even with all of the back and forth flashbacks to the past with her and Alex, I never really felt the love between them. In fact, I grew tried after a while of the flash backs with them together. The only good thing was that I good to see who Frankie was as a person and how she had matured in the present. Frankie's sister, Bella was cool. I liked Alex's brother, David. Who I grew closer to than Alex. The storyline is good: Frankie needs a break from the world after Alex, her fiancé, dies, so she takes off to his family cabin. Since she's from an Italian family, though, she doesn't get much alone time. Good so far. The execution of the story, though, is awful. Author Hannah Tunnicliffe "is a self-confessed nomad," and this book shows it. It's set in the USA's Pacific Northwest, written from the first-generation American Frankie's perspective, but the language is a mess. We don't use "meters"; The storyline is good: Frankie needs a break from the world after Alex, her fiancé, dies, so she takes off to his family cabin. Since she's from an Italian family, though, she doesn't get much alone time. Good so far. The execution of the story, though, is awful. Author Hannah Tunnicliffe "is a self-confessed nomad," and this book shows it. It's set in the USA's Pacific Northwest, written from the first-generation American Frankie's perspective, but the language is a mess. We don't use "meters"; we don't have "expiry dates." Then add the Italian phrases that, evidently, only a Sicilian will understand, and I just kept wondering, "What's the point?" An excellent novel of loss and family ties, truth and its consequences. A lovely novel revealing family and love relationships and their sometimes complex qualities. Loved this book it had a good story line but a peacefulness about it even though the events were sad. I loved the recipes throughout the book. Look forward to Hannah Tunnicliffe writing a third book. Hannah Tunnicliffe has written another wonderful heartfelt story about a woman named Frankie, her Italian family, and her relationship with Alex which is deeply touching. My heart went out to Frankie as she deals with her grief, and as I read this beautiful story I experienced overwhelming emotions from sadness to laughter and everything in between. Not only does Hannah write stories with heart but she also takes you to another place with such detailed pictures that it is like you are actually t Hannah Tunnicliffe has written another wonderful heartfelt story about a woman named Frankie, her Italian family, and her relationship with Alex which is deeply touching. My heart went out to Frankie as she deals with her grief, and as I read this beautiful story I experienced overwhelming emotions from sadness to laughter and everything in between. Not only does Hannah write stories with heart but she also takes you to another place with such detailed pictures that it is like you are actually there with all of her characters in the story experiencing everything they see, feel, and do. Plus she also makes your mouth water with descriptions of enticing Italian meals. Recipes are included so you can actually join the family when they sit down to eat. “Season of Salt and Honey”, was a book I could not put down and actually read twice as it was such a pleasure to join Frankie and her family for a time and a delicious meal. I have finished another wonderful read by Hannah Tunnicliffe. 'Season of Salt & Honey' is her second novel - Her first The Colour of Tea. 'Season of Salt & Honey' is a novel of of love, grief & antipasti. Francesca 'Frankie' Caputo has it all figured out. She's finally going to marry the man she loves and then they will live happily ever after. But when a freak accident cuts her fiance Alex's life tragically short, all of Frankies future plans suddenly disintegrate. Drowning in grief, I have finished another wonderful read by Hannah Tunnicliffe. Drowning in grief, Frankie flees from her overbearing Italian- American family, and escapes to an abandoned cabin owned by Alex's parents, where she reluctantly connects with her forest neighbours - effervescent, flame-haired Merriem, kind, handsome Jack & his sprite-like daughter, Huia. As her heart slowly begins to heal, Frankie discovers a freedom that's both exhilarating and unsettling to everything she has always known for sure. So when her old life comes crashing back in, Frankie must decide: will she slip quietly back into her safe, former existence? Or will stronger, wiser Frankie Caputo stand up and claim her new life. Hach. Hat mir sehr gut gefallen! Von der gleichen Autorin habe ich ja bereits "Der Duft von Tee" gelesen, das fand ich auch schon gut. Und dann hat Frau "Bücher in meiner Hand" das Buch noch empfohlen, da musste es doch ganz nach vorne auf meiner Leseliste. Okay, ein kleines bissle nervt dieses Herumreiten auf der italienischen Herkunft der Protagonistin Das scheint aber was typisch italo-amerikanisches zu sein, das hat mich auch bei den Büchern von Adriana Trigiani, die ich ansonsten sehr mag, i Hach. Hat mir sehr gut gefallen! Von der gleichen Autorin habe ich ja bereits "Der Duft von Tee" gelesen, das fand ich auch schon gut. Und dann hat Frau "Bücher in meiner Hand" das Buch noch empfohlen, da musste es doch ganz nach vorne auf meiner Leseliste. Okay, ein kleines bissle nervt dieses Herumreiten auf der italienischen Herkunft der Protagonistin Das scheint aber was typisch italo-amerikanisches zu sein, das hat mich auch bei den Büchern von Adriana Trigiani, die ich ansonsten sehr mag, immer schon ein bissle gestört. Men come and go, but sisters are forever. Or not? Frankie Caputo's fiance is dead. Torn, she runs off into a forest cabin just to be alone. But world follows - some genuinely care about her, some are neighbours, some might not be welcome here. Like Bella, her difficult sister. The bad girl, the one who might show her that she was not living the perfect life. My problem with this book is that I can not relate to the heroine. Frankie is selfish and immature, the world is supposed to turn around her. Men come and go, but sisters are forever. Or not? My problem with this book is that I can not relate to the heroine. Frankie is selfish and immature, the world is supposed to turn around her. I hope that all the wisdom found in revelations small and big will make her a better person. Grief and despair, love and loss, family and friends, betrayal and a sprinkling of Sicilian recipes all combined in a novel about Francesca, thrown into a complete tizzy following the tragic death of her fiance in a surfing accident. How can she make sense of his loss and life without him? How can she find comfort in her over-bearing family and the long lost treacherous sister she is sure has abandoned and deceived her? Can she come to terms with the almost in-laws who never liked or accepted he Grief and despair, love and loss, family and friends, betrayal and a sprinkling of Sicilian recipes all combined in a novel about Francesca, thrown into a complete tizzy following the tragic death of her fiance in a surfing accident. How can she make sense of his loss and life without him? How can she find comfort in her over-bearing family and the long lost treacherous sister she is sure has abandoned and deceived her? Can she come to terms with the almost in-laws who never liked or accepted her? Unable to deal with any of it, Francesca runs to the cabin in the woods that brought so much comfort and pleasure to Alex before his death. Will she completely unravel in these woods, or will the shelter of this place bring her the relief she so seeks? An enjoyable read, though I admit a little disappointment when I first realised it was set in America. I'm looking forward to this great author setting a book in her homeland NZ. The linking of food and fiction is done better here than in many other attempts I've read, maybe because of the Italian, Sicilian links...the food has meaning in itself, so when combined with fiction the meanings strengthen. too much honey and not enough salt in this story. The author is from New Zealand and is writing about Americans in Seattle, but they do not use the words "petrol" and "mate" in Seattle (or any of the US, as far as I know). I read it because I so enjoyed her book "A French Wedding". While I would recommend "Wedding", I would not recommend this one unless you like your stories really sweet. A good light read. Nothing spectacular about it, nothing terrible about it. A very quick read (read in just a few days), and captivating enough to keep turning the pages. However, the story was not overly complicated, or imaginative. I did like the combo of food and nature, two things I love, but other than that, it was just okay. This is the story of a woman who lost her fiance and runs away to the woods to try to avoid dealing with it. It is beautifully complex in terms of the interpersonal dynamics. It takes a while to realize her blissful life might not have been as flawless as her internal narrative makes it out to be. The process of self-discovery is difficult, yet beautiful. I still liked it even though it needed a finer-toothed comb during the editing process to remove all of the Brit-isms that made it through...petrol, meters, mate (instead of friend), etc. Those were just a minor annoyance, but did make the setting feel less authentic. This book was fine. Someone handed it to me and said something like, "You like to read. Here is a book." Not the type I would normally pick up but I felt pressured to read it. It was ok. Would make a decent holiday read. This was an enjoyable and easy read with pretty good storyline that I thought was very good at pointing out the stages of grief and the family and friends that get us through this very difficult time in life. This story of a young woman finding herself after the death of her fiance was a surprisingly upbeat read. full if food, family and new friendship, it is a story of hope and renewal. Visual descriptiveness and recipes were a bonus. Reading this book made me want to cook more, or maybe just wish I had some Italian in my heritage. A lovely study of grief and nature and family. Coincidentally, I listened to an interview with Amy Florian, who speaks and writes about the grieving process, while reading this book. This added a great deal of color and nuance to the reading experience. Непретенциозен роман, който може да прочетете ако ви се чете нещо лековато. Не е лош. I wanted to love this one, but I just couldn't. The characters fell flat. Particularly Frankie. 2.5 stars rounded up to 3. “To me, the forest is simply green and vast, but Huia knows exactly what she's looking for and points things out from a distance. But slowly I learn. I distinguish devil's club and stinging nettles and salmonberry. I spot the hummingbirds that dart and quiver around pink flowers. I spy a patch of fiddleheads and start plucking before Huia warns me to take only a few so the plant can keep growing for next season. I am the student.